I have to admit, Trapper is my baby. Creating this awkward, stubborn rectangle of fur was more a plea sure rather than a challenge. Given the sheer number of animals in « The Son of Bigfoot », I went down to see the production to ask them to allow me a trip to the zoo. The masked balls of fluff from North America couldn’t have cared less about the low Flemish temperature. They ran along from branch to branch, gathered at my feet, curious to see a crazy hairless animal brave the autumn fog. I stayed there, the only tourist in the park, with my new friends who looked cute enough to eat, breathing on my digits to stop them from getting stiff. Puffed up in their winter coats, these cuties were well fed thanks to being in captivity, and were the perfect model for creating Trapper. 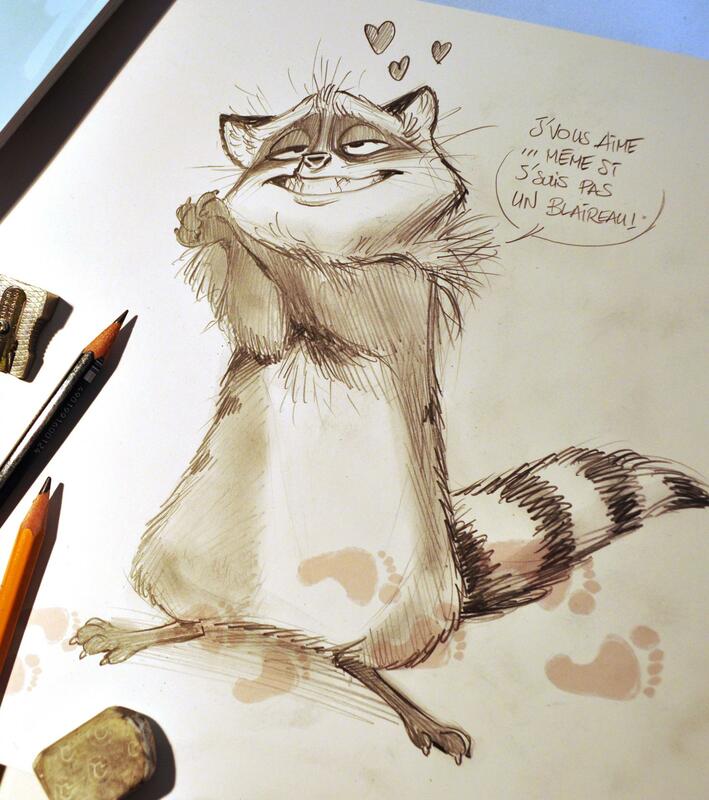 A few sketches inspired by the famous Meeko (Pocahontas) later, and Trapper started to take shape: he had a big nasty smile in an angular face and a well-rounded bottom. Listening carefully to the voice that Joey Lotsko gave the character inspired me to mimic him in some of the expression sheets. Trapper was born, and it was an honor for me to present him in a starring role in the film’s first trailer.